Archives : SUPPORT ZONE HOLDS - 04/10/2013. SUPPORT ZONE HOLDS – 04/10/2013. As expected the support zone in the form of Bullish Rising Gap between Sensex 19293-19444 and Nifty 5688-5738 (besides the 200dma for the Sensex and 50dma for the Nifty) held good this week as the market reversed from a level of 19264 for the Sensex and 5700 for the Nifty. This marks the resumption of the prior uptrend. The uptrend will be in question only when the above mentioned gap gets breached. Sensex opened the week at 19643, made a high of 20052, low of 19264 and closed the week at 19915. Thus it registered a weekly gain of 188 points. At the same time the Nifty opened the week at 5801, made a high of 5950, low of 5700 and closed the week at 5907. Thus the Nifty closed the week with a gain of 74 points. On the weekly charts, both Sensex and Nifty have formed a Bullish Piercing Line, which is a Bullish Reversal pattern. On the daily charts, both the indices have formed a small white body candle with a long upper shadow almost like a Shooting Star. But for a Shooting Star formation, there needs to be a gap between last two candles, which is not the case here. Also there is a small Bullish Island Reversal completed when both Sensex and Nifty opened with a Gap up on Thursday. The Bullish Island Reversal will fail only when Sensex goes below 19264 and Nifty 5700. Thus in the immediate term candlestick pattern indicates continuation of bullishness. This week both the indices tested the strong Support Zone formed by the confluence of the Bullish Rising Gap between Sensex 19293 – 19444 and Nifty 5688-5738 along with presence of 200dma for the Sensex (19403) and 50dma for the Nifty (5698) inside this gap. The market bounced back from Sensex low of 19264 and Nifty 5700. Thus this gap holds more significance now than before and a breach of this gap will end the current uptrend. The above mentioned Gap is also a Measuring Gap (Sensex 19293 – 19444 and Nifty 5688-5738) in the current upward rally (the rally which started from a low of Sensex 17448 and Nifty 5118). If this gap continues to hold, then as per Gap theory, the target for the upward rally works out to be Sensex 21289 and Nifty 6308. This week Sensex bounced back from its long term average of 200dma and Nifty from its medium term average of 50dma. Both the indices have thus managed to close above the long term average of 200dma (Sensex – 19403 and Nifty – 5840), medium term average of 50dma (Sensex – 19258 and Nifty – 5698) and the short term average of 20dma (Sensex – 19809 and Nifty – 5860). Thus the trend in the short term, medium term and long term timeframe is positive. Market will again enter a corrective phase if Sensex breaches its current intermediate low of 19264 and Nifty 5700. The correction levels thus will be 19482-19094-18705 for the Sensex and 5751-5630-5510 for the Nifty. MACD is in Sell mode even though in positive territory. ROC has turned positive and is now in Buy mode. RSI (55) has moved above the equilibrium line, suggesting bullish momentum. Similarly MFI (51) too has gone above the centerline line on Friday, suggesting money flowing in. Stochastic Oscillator continues with its Buy signal (%K is above %D). ADX has decreased and is at 18 suggesting that the market trend is sideways. The Directional Indicators continue with its Buy signal as +DI remains above -DI. OBV is moving sideways. Buy signal in Bollinger band got negated this week when the indices closed below the mean of 20dma on Monday. The Nifty O.I. PCR is steady at 1.31. For the current month series, highest Open interest build up is at 5700 Put and 6100 Call. This suggests that the market expects a trading range with support coming in at 5700 levels and resistance around 6100 levels. Friday saw high amount of Call writing at 6100 strike which confirms that level of Nifty 6100 will act as very strong resistance. The Trendline Resistance for the Sensex is at 20342. The Trendline Support for the Sensex is at 19454. 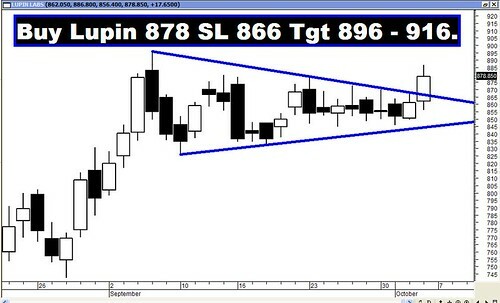 The Trendline Resistance for the Nifty is at 6131. Trendline Support for the Nifty falls at 5766. For the week ahead, Sensex will find Support at 19596-19293-19007 and will find Resistance at 20203-20443-20739. For the week ahead, Nifty will find Support at 5802-5688-5581 and will find Resistance at 5982-6142-6229. All the Recommendations of previous week reached their targets with the exception of McDowell. However the Star Performers of the week were Britannia and Tata Comm which went up by 12% &11% respectively!! !